Analysts are steadily growing bullish on the company’s prospects as is evident from solid upward revision in its earnings estimates. The Zacks Consensus Estimate of $3.57 for fiscal 2018 and $3.70 for fiscal 2019 has moved up 3.8% and 3.9%, respectively, in the last 30 days. Upward estimate revisions reflect management’s encouraging view for fiscal 2018. Management envisions fiscal 2018 earnings per share of 3.50-$3.65, up from the $3.35-$3.55 range guided earlier. 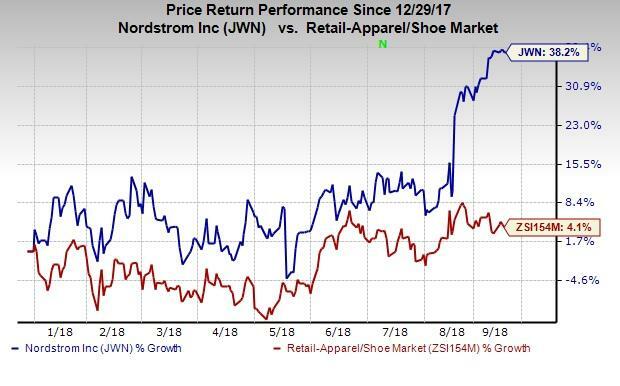 Impressively, this leading fashion retailer has delivered top and bottom-line beat in second-quarter fiscal 2018, marking the eighth earnings beat in nine quarters and fourth positive sales surprise in five quarters. Also, stellar first-half results have led management to raise its guidance for fiscal 2018. Nordstrom has been aggressively focusing on store-expansion strategy to gain market share. The company has successfully completed its planned full-line store expansion in Canada by opening six stores in the country. Overall, Nordstrom envisions a $1 billion sales opportunity from its expansion in Canada by 2020, including six planned full-line stores and 15 Rack stores. It remains on track to open three new stores in fall 2018.